One Card, All the Favorites! When you need to reward or incent a group with many different tastes, think Darden®. 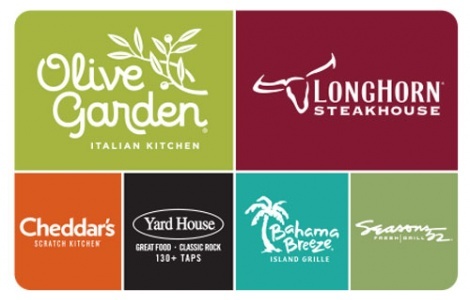 From salad and breadsticks to Flo’s Filet®, we have 6 distinguished and diverse restaurants on one card. You pick the experience. National Gift Card is the best place for you to order Darden Restaurant gift cards in bulk. We are the experts in all things gift cards and can set up your gift card solutions program for you today. Please contact us for more information on Darden bulk, direct-to-recipient, or individual gift card fulfillment for your gift card program. Contact us online or call us at 888-472-8747 today!